So thank you very much for taking the time to call me. Oh, pleasure indeed, thank you so much for taking an interest in the movie! I’ll try to work on my English pronunciation throughout this interview, so I’ll do my best. Very good, I’m afraid I’m absolutely no help with the French. I studied it in school and well…basically I think I failed at every year. So would you like to begin? Okay. So the release date of “A Dog’s Breakfast” in France is scheduled for July the 1st, how do you feel about releasing the DVD of a movie that hasn’t been broadcasted in France? You know, I have these very fond memories of France because we took “Cube”, a movie I did years and years ago with one of my oldest friends Vincenzo Natali, to the Paris film festival and we had, like, the best time of our lives. I absolutely loved it. And the film did very, very well in France as well so we…we love the French! It’s also just a way of life as well, something about being in Paris and touring around France that really made it sort of a magical time for us so, you know, it’s always been a place I’ve been dying to get back to at each chance I get. In fact Vincenzo has just finished doing, I suppose it’s in post-production work, a film called “Splice” that I did with him, which is a film that Guillermo Del Toro executive-produced. I think it could be out at the end of this year so…So we’re never that far away from France it seems. Yes, and don’t worry, the French love you too! Ha! Well that’s great, good, I should…I kick myself because I wish if I spoke better French maybe I could actually do some of your good movies. Especially in Canada as well, the French-Canadian movies are just so much more superior it seems than the rest of the country stuff. They make these amazing, amazing films. So do you have any clue why the Fox/MGM is not keeping the original title for the release in France? I don’t, no. There’s probably some geniuses in marketing somewhere who have decided that it’s better to sort of play with it. That’s one of those things that once you give your film up to a studio like this, they have to make the decisions because it’s basically their product at this point so they are going to do whatever they feel is the best for the film so it can be quite frustrating because, you know, that was the first [time] I’d heard of it when you told me so as a filmmaker and someone that has put so much time and energy into a film it’s such a hard thing to give up, you know. I had originally, when we made the film, thought about self-distributing it because I’m a complete nerd and I love the Internet and the idea that the marketing and distribution model for films is changing so much. And also I feel, because I’m so much like McKay in that way and I feel that I know better than anybody else, I feel that the film should have been released at the same time to everybody all over the world. It just made so much more sense for me, and I don’t understand ruling it out and, you know, why is France getting it two years after the States, it doesn’t make any sense. Especially when a show like Stargate has such an incredible international audience, to make certain countries wait longer than others…I know it’s probably a necessity of the way they do business and it’s these big companies with lots of different branches and lots of different legalities to deal with but uh…to me that’s the appeal of self-distribution, it’s that you basically do it all yourself and release it all at the same time and basically change the rules a bit. So maybe the next time, maybe the next film we’ll do that way. But in the mean time, the beautiful thing about MGM is that they’ve done a fantastic job with the film and putting everything on DVD. I mean the DVD, if it looks anything like the one that we’ve got here, it’s gorgeous! I mean they’ve done some great design stuff, obviously whoever designed it really…they had some fun with it, they’d obviously seen the movie and sort of got it, so the menus are all centred around these bowls of cereal and they’ve just put it together really nicely. And of course Jane, my producer and wife, good combination by the way, did a fantastic job with the behind-the-scenes stuff. There is so much stuff there. You know, sometimes you get a DVD and you’re a little disappointed because it’s just the movie and like a couple of silly little things that don’t do much for you. This time I feel like it’s a good addition for people who even seen the movie because it does have a lot of extra background stuff and we’re very proud of it I must say. My son put it on the other day. He’s two years old and he went and shoved it into the DVD player and we sat down and watched a bit of it with him and it was quite funny you know, because I hadn’t seen it in a while and it’s nice to sit down and watch it again without any sort of stress of being the filmmaker involved. It sounds like a Peter Greenaway movie, doesn’t it? It sounds like “The Cook, [The Thief,] His Wife And Her Lover”. It sounds very intelligent. Which, I should just let everybody know, it’s not. Could you tell us a little about the bonuses in the DVD, the extras, the commentary? One of my favourite commentaries that I was ever a part of was the Cube commentary which is basically…I sat down with two of my oldest friends who were involved in making the movie, Vincenzo [Natali] and André [Bijelic], we just talked throughout the movie! We basically got to do what everyone doesn’t want to do while they’re actually watching movie, which is talk through it, and make comments and jokes and go off those little tangent stuff. So I really wanted to do the same thing with this and it got a little out of hand because my mother was visiting so she came in, so you can hear her in the background every so often, and she’ll say “oh, I remember this bit!” …So she’s on there and the dog every so often decides to get up and knock over a microphone or something so it was actually a lot of fun, it was actually a bit like having the family together to watch a movie. It doesn’t make a lot of sense. It definitely wanders off in different tangents and stuff. The movie is very much like a labour of love, it was never…originally we weren’t even going to release it, it was never…when I first wrote it I just wanted to shoot something on video, and I thought maybe I could just show it on conventions or something. And then because of Jane’s smart move of bringing in John Lenic from Stargate and getting his involvement in the project, it just became a real film. So it just made sense to release it like a real film and I think what’s nice about the behind-the-scenes stuff is that we had people there basically everyday to shoot, so Jane’s job was really cutting it all down so that there was a nice true line for each of the behind-the-scenes sections, and she’s broken it down…and it’s was she used to do, she used to work for Entertainment Tonight and Entertainment Weekly and all these big sort of Hollywood shows down here in Los Angeles and it really shows because she has put together a fantastic, fantastic piece. And again, Ivon Bartok was the guy that was shooting a lot of stuff for us during the show, and he’s the guy that does all the Stargate behind-the-scenes stuff as well. So it was really both our family and the Stargate family getting together and having some fun and that’s really what we wanted to achieve. It’s fun to watch the movie again now because I see us having fun and that definitely appeals to me, it’s like watching “A Fish Called Wanda” or any of those silly comedies that just make you laugh. You know it’s supposed to be silly and funny and entertaining and I hope it translates, quite literally in the case of the French release. The French have a good taste, so hopefully they’ll like it. Yes, well you guys certainly know how to live your lives, that’s for sure, Paris is just and amazing, amazing place to be I gotta say. And we did a festival out there as well, I wish I could remember where it was, beautiful little festival. And we got to live like the French for a little bit and of course we now we envy you terribly! Looking back at the production of “A Dog’s Breakfast”, what was the most difficult task to do? The most difficult task in a production…wow…I think it was just trying to keep it on time and on budget, I mean we had so little money and I was so adamant that when we were shooting we would keep the days to a twelve hours minimum…err, maximum, …minimum… I wish. Because we had the crew and most of the crew if not actually all the crew was working for free but it was basically if the film does well then we got to pay them so another reason for everyone to go out and buy a copy, that crew has families to feed. But it was just basically trying to keep it fun, keep it light, and yet shoot it in such a short period of time. Basically it was just a 14-days shoot, and trying to do a movie in that time is very, very difficult, even with a lot of money, so that was definitely the most difficult thing. And actually I say that but the most difficult thing was probably remembering my lines, because I kept forgetting to talk! I was so used to being the director by the time we started shooting that I sort of arrived on the set the first day and went “Oh my God I don’t…I don’t know my lines!” .The last thing I was worried about was the acting, so it was quite funny to have my sister making fun of me because the director and the writer doesn’t know his own lines. Was it easy to shoot with Mars? Oh, Mars, yes…no! Everyone says “don’t shoot with dogs or kids”, and I can only imagine the kids…kids would probably be more difficult I suppose. But Mars was actually great when he was on camera but off camera he was a real pain because, you know, what do you do with this giant dog and this tiny house when you’re trying to shoot a movie…So I think there was a lot of sound issues because he kept wandering by and it took me a while to figure out that I should take his collar off because he kept making noise during the shoot. And of course we needed him on set and I used him basically uh…someone calls it the “hinge shot” …so basically if you’re in a scene and something goes wrong you can always cut to a shot of Mars looking puzzled or looking amused of just sniffing himself or something. So he had to be in every scene and basically the crew became a dog-sitter from time to times. But he was fantastic on camera, but then like all actors he became a little difficult once he was off. I don’t know but there is one, I can tell you that. Yeah, I know, I’ve seen it. Yes, and I was a little jealous there in the reviews, especially by the fans, they always singled out Mars and I felt that perhaps I was overlooked a little bit because of that. So you know…let’s just say I feed him less now! The part of Christopher Judge in your movie is excellent, how did you come up to have him on the board? Chris Judge…I always say about Chris Judge that there is a type of actor that has, for want of a better word, a “light”, like there’s something about him when he walks into a room you can’t help, you always look at him, you always pay attention to him. And he doesn’t have to do anything, he’s just standing here silently and he becomes the centre of attention, he’s just like this almost magical beast. He is incredibly funny, he has done Stargate for God-knows how long and he rarely has anything to do on Stargate, you never really see him say many lines and he was just so funny and so completely wrong for the part that it seemed right to give it to him. It was actually Jane’s idea, I had originally thought he should be, you know, he was a guy that couldn’t get a date, he should look like somebody who can’t get a date and she actually said: “Wouldn’t it be funnier if it was Chris Judge because it’s so silly to think that Chris Judge couldn’t get a date if he wanted one”. So at first I thought that she was crazy, but we did the read-through, we all sat down and read it, and he was so funny in this one little scene that I had written for him that I ended up extending the part, probably to three times the size and I wish I had put him in it more because he was so much fun to work with and the day he was in was just my favourite day, it was the only day that I really sort of relaxed because he just puts you at ease and he’s just the most ridiculously inappropriate and funny man you’ve ever come across and every time I sit down to write something there is always and there will always be a part for Christopher Judge in my stuff because he’s just…he’s a movie star! There’s nothing else you can say about him. Christopher Judge is a movie star, I just keep waiting for him to get his big break in that regard. So how is doing the production of “Starcrossed”? Having her and Paul McGillion and the whole crew around, and Michael Lenic, it was that much more amusing because we were in the middle of shooting Stargate so all of Starcrossed suddenly seemed very sort of close to home because it was a bit like “Galaxy Quest”, it amusingly mirrors our experiences shooting Stargate sometimes. It’s obviously sillier but I think there’s a very funny side to shooting Sci-fi. Sci-fi is all very serious and stuff but watching it being shot is very amusing so…We actually have a show that we are working on now called “Starcrossed” which is a behind-the-scenes comedy about making Sci-fi because we were just so taken with that part of the film. And the fans really liked that part of the film as well. So is there going to be a link between the movie and your current project “Starcrossed”? I think in some ways, yes, I mean it really depends how it gets made at this point, I mean it has been with Syfy out here for a couple of years and we have now been asked to go and develop it ourselves and bring it back to them later. So basically it’s our job to make it now, we’re looking in to have to do that. There are definitely going to be lots of call-backs and again I think I would be foolish not to use my friends to the maximum amount so I will no doubt be using lots of my fellow Stargate characters for that. Do you plan to act in your current projects? Yeah, shooting “A Dog’s Breakfast” was so difficult in some ways because having to be in every scene and also to direct every scene was pretty difficult so Jane was absolutely invaluable in that. She had to sit behind the camera and make sure that we were getting what we talked about previously. I would sit down with her and tell her what I wanted to do for the day and then she would sit behind the camera while I was in the scene and make sure that we got it. But it was very difficult, so I think I would prefer to have less to do but that said acting is what I’m known for so I think I would be foolish not to make the most of that as well. And I do love doing it so…It’s one of those things that I miss the most about not doing Stargate anymore, it’s getting to come in every day and do what I love for a living. I’ve read something about another project of yours, it’s called “Design of the Dead”. What can you tell us about it? I’m one of these people who believes that you should have a million projects going because you just never know what people are going to want and what’s going to happen and when so I basically always have a million things going at the same time. “Design of the Dead” is gone through a couple of different changes but basically it’s a film about one of these reality shows that shows people flipping houses, you know, for profit, they buy an old house and they fix it up and then they sell it for a lot more money and I just thought that it would be very funny to do one about a TV show that is showing someone flipping a house except that once they bring the house back to life they also bring back the Dead. Basically it’s home-renovators trying to battle zombies. I felt that it would be quite funny to make it to a film. So that’s one of the projects I’m working on right now. It combines two of my favourite genres, the horror genre and the home-renovation show. Those are the two things I generally watch on television, so I thought that it would be fun to put them together. And I thought having Chris Judge as a flamboyantly gay designer would be the way to go as well. The poor man probably doesn’t even know that I’ve got that lined up for him, but that’s his thanks for working on “A Dog’s Breakfast”, trying to drag him into that as well. In various interviews you said that you were tired of those big distributors that took ages to release your movie and that you decided to do that yourself from now on, what are you planning to do and how? There are a couple of different approaches that I’m looking at. One of them is looking for my own financing so basically looking at private investors who want to get into the film industry and want to be a part of our projects. I believe if you make films that are cheap and smart, whether they are funny or exciting or scary or whatever you want to do with it, basically I believe that films need to come down in budget. They’re too expensive to make and too expensive to distribute through the Big Guys and what I’m seeing is films that I love that are being distributed through other means. Soderbergh is a great example of that, he puts out films that he wants to make, I mean some of them go through the big studios like the “Ocean Eleven”, all that kind of jazz but he also makes these little films like “The Girlfriend Experience” or there is another great one I wish I could remember the name of, but if you look him up he’s done a number of these great little films. To me it’s not so much that the big distributors are big evil entities or anything, it’s just that I think they’re very slow, because they are traditional, old-school companies and they have a process for doing everything, whereas if you’re self-distributing you don’t have as many of the advantages you have when someone like MGM…you know, MGM can put out huge numbers of DVDs for very cheap and they have got connections all over the world, they can do an international release, but as we see it, it takes a really long time to do that. So my hope is to be able to put at what I would call a “regionless” release of my next films, so one that would be playable everywhere in the world. You would put that out, I would look for people to help to fund the project, I would look for people to help to market the project…basically do what someone like what Joss Whedon is doing with “Dr. Horrible’s Sing-Along Blog”, he’s got an audience who want to help him, who want to be a part of the things that he’s doing…and I feel that way, when I see these little films I want to support them so I want to make use of that. I’ve talked to Jane about how best to go about doing it. The biggest issue right now obviously is getting funding because now is not a good time to be looking for money, you know, because nobody has any, but that said I think as long as you’re smart about it and you keep the budgets down… I mean we made “A Dog’s Breakfast” for 120,000$, there’s no reason why that shouldn’t be in profit right now except that, again, with the big distributors they’ve got big costs associated with distributing the film. With us, our costs would be very, very, very low so the hope is that it can actually become a viable business model and also allow us to make more movies faster and get them out to people. So I think I’ve probably not answered that question very well but basically I would like to be able to put out the DVDs ourself, go around with them, show them in theatres, sell the DVDs at the same time. I even wondered about releasing a book version about the movie first, I was joking that it was like directing on paper, the idea of putting out a little book or a novella that would detail what the movie was going to be about. So it’s a fun little read, you can leave it at that if you want, or you can get involved in trying to make it as a movie as well. Basically looking for different ways of getting people interested and getting people involved and getting movies made, because I just love doing it, it really is ridiculously addictive. And I advise everyone else to do the same, there’s no excuse now, there’s cameras and equipment and a general knowledge of film out there now that anybody could be doing this. And everyone should frankly, I mean if you’ve got a good story to tell then it doesn’t matter how it’s made, and there’s ways of getting it shown now so…if you’re making one let me know! Because I’m not working right now! I’ll let you know, no problem. What about the project of a sequel of “A Dog’s Breakfast”? Yeah, that’s definitely one that we have talked about because people do seem to react well to it. We talked about “Heir of the Dog”, maybe do something that involves a baby or a puppy, so we’ve definitely talked about that and such, but right now I’ve just got so many things in works right now that I haven’t had a chance to sit down and work on a sequel yet, but it’s definitely something that I’d like to do, and I think that it’s something worth doing because I think what’s nice about having the film out like this and it being able to be seen in places like France, which is just more than we ever dreamed of, is that with a little bit of a name behind it I think a second one would actually probably be an improvement, both in the release and in the execution. About Atlantis, have you seen the scenario of the movie or are you totally out of the loop? Totally out of the loop, the actors are always the last to know of these things. I’ve heard rumours that we’re going to do a movie, I’ve heard rumours that we’re not going to do a movie. I basically just wait, that’s it, that’s all you can do, just hope for the best. Stargate was just the best job I’ve ever had, it was just fantastic, amazing people to work with, and just a great experience and I miss it terribly. And also as a sci-fi nerd I was a part of the sci-fi entertainment industry, which is just fantastic, to be there, to do ComicCon every year and to do all that kind of stuff. So I definitely miss it, I really, really enjoyed my time on that show. What is nice about not being on a show everyday is that you’ve got time to pursue your own stuff, which is basically what I’ve been doing. That’s the hope. I mean there’s definitely keeping an eye out for acting jobs as well, but basically just focussing on getting my own stuff made. Amanda Tapping is an inspiration to me on that, because she’s just on such a fantastic job of transitioning from the Stargate franchise into her own franchise with Sanctuary so I think she’s a great example of alternate means of distribution and how that can succeed. I mean, she ended up with a TV series, it’s fantastic! What they’re doing over there is incredibly inspiring and she is a very smart one so I look forward to battle with her again. Yes, I’ve seen this series. Are you planning to work with her again in Sanctuary? Yes, I would love to. Unfortunately I got a call about possibly doing some stuff with them again but the schedule didn’t work out, as always. Unfortunately I was busy when they were doing it. But I hope so, yeah, a lot of those guys are from the Stargate days and obviously working with Amanda is such a treat so I’m hoping that another opportunity will come up in that regard. Yes, the psychotic. They ended up changing it for the televised version. I call them up and said: “What the?!? Well, great, I’m good enough for the Internet but not good enough for television!” .Martin [Wood] was actually very embarrassed about that and was explaining his reasons behind it which were all very solid. But yeah, I think it works out actually nicely because it means that I can do the television series basically, if it worked out, because I’m not established as a character already. And not established as such a creepy character. To me it was a fun little role though. It was one of the ones I definitely pushed for because it is so different from what I have been doing at the time. I’m excited to see what will happen with that, the new season is coming up I think, they’re finishing up their second season, I’m not sure where they are but if people want to see true innovation in a television show then they are the guys to look at because they’ve gone about everything completely differently than anybody else and it has worked out really well for them so I’m very happy to see that happen. Now that you have some free time, what kind of shows are you watching? Ah, I’ve been able to watch a lot more television, although I say that but I also have a kid, so the two-year-old now, well, almost two-year-old is dictating a lot of television. I watch an awful lot of Pixar animation now. I think I’ve watched “Finding Nemo” like fifty times now. But television wise, there have been a few things that we’ve got hooked on. Obviously Battlestar was a big one for us. We watched all of the Battlestars, you know…it went on a bit at the end I thought but that is some great sci-fi, we were watching Battlestar, we watch uh…a show called “The Unusuals” that we are really liking, it’s sort of like an odd cop show, but I think it’s just been cancelled after one season, so God forbid if I like something it seems like it’s going to be taken off the air. And the other one that we are really enjoying I think basically because of Nathan Fillion from Firefly which is one of my all-time favourite sci-fi, I actually think Firefly is probably the best science fiction that has ever been shown in television if you ask me. And the lead character, Nathan Fillion, is in a show called Castle, here now, and it’s kind of like Murder She Wrote, it’s really funny and he is charming and he’s always fun to watch, so that’s another show that we’re watching. So what else…oh, yeah, 30Rock, God it sounds like I’m watching a lot of television now, and The Office, and all of those silly things. Anything that’s silly I’ll watch. Ha-ha. I would love to be in The Office. That would make more sense in my books. It makes much more sense for me to be silly than to be serious. And actually in The Closer I’m pretty silly as well. Yeah, that was a lovely experience. I didn’t have an awful lot to do, so maybe that was why it was such a lovely experience, I didn’t have to say so many lines like I normally do… But that’s a really, really friendly set to be on, everybody seems to get along very well and it’s so well run and the writing is very funny and…well I only worked like for a week on it and as I said in a number of small scenes throughout that time. They were joking about possibly bringing my character back because he was just so painfully uptight, but it was kind of fun to play a incredibly uptight FBI agent who just disapproves of everything that Kyra Sedgwick’s character does, so it was kind of fun just to stand there and look uncomfortable through a lot of scenes and she’s just fantastic. She’s just an amazing example of what a character-actor can do with a cop show. It’s like in Monk of something. I’ve always been a fan of those kind of eccentric detective types, I loved Colombo when I was younger. It was fun just to watch her do her stuff, and boy that set is fun to work on. They brought Tacos and there was an ice-cream truck and I loved it for all the wrong reasons as well. I think I gained like double my body weight while we were shooting that show. And it’s just fun because you’re shooting a television show in Los Angeles, that’s were every actor’s dream is, isn’t it? You get to sign in, in the morning, and park on the set and walk and there’s those big old studios that used to be run by Charlie Chaplin and Mary Pickford. There’s so much history in those places, it is quite inspiring to walk around those studios and actually be allowed to be there. Not being there as a tourist makes a big difference, having a reason to be there. A working actor now there’s nothing better than that. Oh, did you? You’ve got to go back and watch the old ones, because I was a big, big fan of the Jon Pertwee and the Tom Baker years, I mean the new guys are all very good and well, but growing up it was those guys, those guys were the originals. I’m a big fan of David Tennant. I love how he plays. Yes, he’s a very, very good actor. I’m so jealous of him because it’s such a fun role and he is obviously having a lot of fun with it. I remember…I saw him do…he did a miniseries for the BBC as well, that I wish I could remember the name of now , but he’s a very talented actor in general and I think having someone like that in the role of Doctor Who is just very smart. And he’s just young, and he’s fresh, and he’s irritatingly funny so uh…so basically I hate him. And what do you think of the new Doctor? I don’t know! That’s like the big mystery. I made no bounds with the fact that I wanted that part, but it seems they’ve gone a bit younger. But I’m very curious to see how he goes, how he does, I think it’s interesting to get somebody…well, again maybe other people know him but I’ve never heard of him. And he’s got sort of an interesting corky quality to him. So I’m curious to see how he does with it. I will definitely be watching, you know, I’ll be taking notes. Back to the Stargate franchise, what is your point of view on Stargate Universe? You know, I’ve got no point of view. I haven’t seen it so…it’s one of those weird things, as an actor who is no longer doing the show it’s that sort of weird bittersweet thing. I think it’s fantastic the franchise is continuing and I’m curious to see what they are going to do with it but at the same time I think “How could they possibly do a show without me?!?”. You’re not going to play a part in the season premiere or a small appearance? Nope. No. They are already shooting and I have not been a part of it thus far. They’ve talked about really trying to move it in a different direction so I think it’s difficult to do that if you have all the same characters. I know there are some crossovers and there have definitely been some crossovers with the SG-1 characters and such… I don’t know what happened there, I mean I would obviously love to be a part of it, and I’d loved to have been a part of it but I understand they have to have their own lives, they have to do their own things. So you know, it’s not really my call. Hey, if I had my way I’d be in every episode of every show ever! So, you know, we’d get pretty bored watching television so it’s probably good somebody else is running things. Right now I’ve been trying to work on my own little science-fiction thing so we will see how that sorts out. What advices would you give to someone who wants to be like you? Ha-ha. I would advise them to get a different person! Try to be someone else! I think the big realization I made when we did “A Dog’s Breakfast” was that anybody can do this. I mean, there are the tools out there for people to make their own movies and to tell their own stories, and in a million different ways, whether it’s with animation or puppets or real life actor or whatever you want to do, I mean there are so many ways of getting that stuff out there and getting it seen. I think that if someone wants to get into acting nowadays, that what they should be doing. They should be working with people who are making their own projects and doing their own things. It’s silly to wait for the standard, the big movies and the big TV series to come looking for you because the reality is that the stars of today are coming out of …I mean anyone is a big star today, they’ve all started in independent films, Al Pacino was doing little tiny movies and so was Robert DeNiro, they were the indie film scene in New-York, and now they are these giants movie stars. Like “Good Will Hunting”, those guys…You need to take an interest now in creating your own stuff because it’s almost returning back to the old days, like the days of Chaplin and the early days of the studios. You need to act, and write, and direct and do it all yourself now, there’s no reason why you shouldn’t. And it’s all knowledge that can be used when you get hired for you first real professional job. I was lucky this was what we were doing…and it was harder when we were doing it with little independent films that I made with friends in high-school, who are now making films with Guillermo Del Toro. It started with these little short-films that we used to make during our high-school vacations and I think what I’ve learned, what I’m trying to tell to other people is that they should… Go to your local film school, tell them you want to be an actor, get in there, do some acting, but if they can’t find you an acting role then great, pick up a light and start lighting, or pick up a camera and start shooting something. Just get in there and do stuff, it’s so much fun being there, and it’s never as much fun as it is when you’re just doing it for the love of it. As soon as you start getting paid it becomes a job. It was fun to go back to “A Dog’s Breakfast” because it was back to the old days, it was like the biggest short-film I’ve ever made! It reminded me of what it was that I loved about what I was doing. So my advice to anybody is just to make stuff, make your own, make all the mistakes now, do it now, get all the stuff wrong now so that when you get hired for that big budget Hollywood movie you don’t look like an idiot in front of a million people, because you’ve already done it a thousand times in front of a thousand. That’s definitely my advice: pick up a camera, doesn’t matter what it is, don’t worry about the technical side of it, and just tell some stories. Just like you said on Twitter, did you start looking for the next great thing that is going to revolution the web? Ha-ha. I think every nerd has in him this burning desire to find the next great internet revolution. You’ve seen it with Dig…the guy who created Dig. That’s the dream, isn’t it? You’re going to get a programmer and for 150$ you’re going to created the website that worth billions. And Twitter is such a ridiculously simple thing, and yet has become such a complex creation. I’m always a little sceptical about how these things are going to fair over the long term because I think I’m indicative of a lot of people out there and I’m very fickle. If Twitter becomes too big and silly then I’m going to move on like the other guys are going to do. I have not found the next best thing. Twitter is highly addictive to me because it obviously appeals to my ego! I basically have a forum in order to express my opinions without really having to put up with anybody arguing with me. It is also a great way to make little contacts with the fans every so often and to be able to answer the odd questions and make the odd comments and just sort of welcome them into the whole silly world of being an actor, being a writer and being a director, and being in Hollywood. Well, I was saying to my wife that it looks better than any I’d put together. And that’s the power of this media, that’s the power of the Internet. Look, we’re having an interview over the Internet that is costing us nothing. Normally this would have cost a fortune, long-distance feeds and stuff, even something as simple as that… I never leave my laptop anymore, there is always something to be doing with it. So it’s an incredibly exciting time to me to be a nerd and to be a filmmaker and to be an actor. It seems like there are so many possibilities, the hardest thing I find is prioritizing them, and it’s like “what should I be working on now?” .Everyday I feel like I’ve got a different thing I should be working on. My wife needs to sit me down every so often and to sort of point me down in the right direction. Right now I’m writing a pilot [for a] television show which is also a movie…basically a movie that would work as a pilot for a television series for MGM right now, which would be kind of fun. That’s eating up a lot of my time. But it’s just so much fun to be a part of this industry right now. To conclude would you like to add something to convince your French fans to buy your movie? Ha-ha. Should I just beg them? I’ll just go “Pleaaaase, God…”.Hum… I just think, not to overstate if too much, but I mean we really, really enjoyed making this movie, and I really appreciate the people who’ve tracked it down, through any way that they’ve done it, legal or not legal. I really appreciate the interest that people have taken and I do hope they’ll buy the DVD, simply because I think it will make you feel a part of the process. Very much. 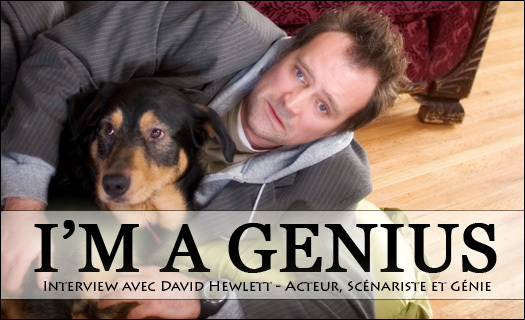 I think it will make you a part of the “A Dog’s Breakfast” fans, and get an inside into the Stargate family as well. It was so much fun to make and I hope it is as much fun to watch. The advantage of the DVD is that you get a lot of the behind-the-scenes stuff that just isn’t available anywhere else. I do think it is worth the purchasing, I think it’s worth buying it and I’m just not saying that because… I think we’ve definitely try to put together something that collectors will like, and people who want to do this for a living will like, and people who just want to laugh of what an idiot I am. They too will like it. Thanks a lot for this interview. I hope there will be a lot of fans to participate to the contest. Oh, fantastic! That’s great! Well, we did this thing…I can’t remember if it was my idea or one of the people on the web’s, it’s so hard, I claim them all as my idea now. What people were doing is was that they were taking up these little posters. We just thought it was kind of fun. You know, I always go and look at signs that say “Lost dog” or “Have you seen this dog?”, lost pets to me are always…I always look to make sure that if I see them I could help out, I think. So we just thought I’d be kind of funny to do a kind of “lost dog” poster for the movie. We basically sort of went around putting these things up and handing out postcards and such and basically said “Have you seen this dog? If not, go watch his movie”. And also I love seeing what people come up with, whether they make their own posters or whether they use ours and where they put them and who they’ve talk to to put them up. It’s always fun hearing about the conversations that people have had in video stores where they have gone in and asked if they have the movie and if they don’t they have told them how to order it. Again, it was a movie made by a lot of people, you know what I mean? I get the director’s credit but the reality is that there is so many people involved in this, and so many people who weren’t even there shooting it. Many people after the film was made helped to make this movie what it is. And I think [that you should] document it, I want to see you guys out there, I want to see the cafés you guys go to, I want to see the pet stores where you buy your pet’s food. I think you’ll find that there is a lot of fans around the world who’ll get a kick out of seeing that stuff as well. Let’s make the French release the biggest thing ever and then I can just base myself there and I’ll just make French movies for the rest of my life. I’ll try to do it! I really appreciate it, thank you so much for this, it really is inspiring to have people like you taking an interest in this. I appreciate it very much. Thank you very much for this interview, it means a lot to me. Thank you. Oh, great, well, enjoy it. Let me know when it’s up and uh…hey, I’ll Twitter it! Fantastic, I appreciate it! Merci beaucoup ! See you later!